● a page-turner — I remember reading it in the backseat of my in-laws’ car on my Kindle in the dark on the way home from Disney. I read it any chance I got. ● one of the best books I’ve read — Like I said, SO well-written. Also, the story is particularly gripping because it’s true, and it’s incredibly well-researched. I learned so much. 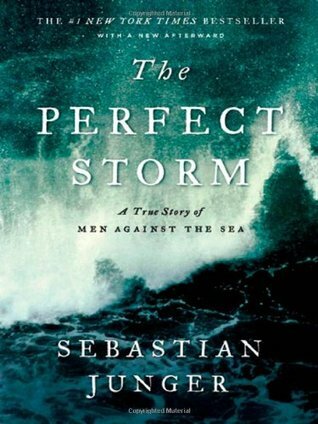 ● painful & sad — If you’re not familiar with the story, it’s about a fishing boat that disappeared in a huge storm. Junger recreates what happened, including the rescue efforts. It’s a tragic story by its very nature. ● tear-jerker — Like I said – they disappear at sea, lives are lost. Enough said. ● a roller-coaster of emotions — Junger catalogs the emotions of the crew, the rescuers, and the surviving loved ones, which packs in a lot of ups and downs and varying coping mechanisms. It’s been over two years since I read the book, but I still think of it as one of the best books I’ve ever read. It’s definitely one of the best non-fiction books. I would, at some point, love to see the movie but I know that it’ll be an emotional one…maybe I should wait until I’m not a pregnant emotional mess! Ha! The Perfect Storm! I don’t know if I could handle reading this one. I only saw bits of the movie and I could barely take it. I’ve seen very positive reviews about the book though. Oh it’s definitely the kind of reading/viewing you have to be mentally prepared for… in the right frame of mind!